A versatile attorney, Jim Griffin has litigation experience on both the plaintiff and defense side, giving him a broad perspective and skill set. This versatility in a wide variety of industries including financial institutions, health care, agriculture, real estate and manufacturing, helps to provide insight and a unique evaluation approach to any case. Jim has been the lead lawyer in more than 30 jury trials, many bench trials, and several multi-week arbitrations in Missouri, Kansas, and other states. He earned his law degree from the University of Virginia in 1983. 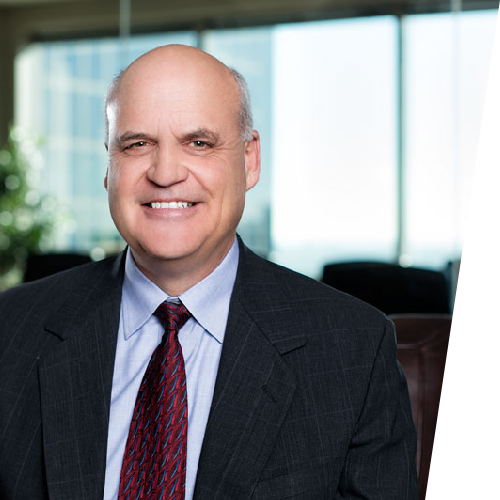 He spent the first 30 years of his career with a local AmLaw 200 firm, Husch Blackwell LLP, where he served as its head of litigation and mentored young trial lawyers. First chair trial lawyer in over 30 jury trials, two multi-week arbitrations and numerous bench trials. Litigated a wide variety of complex contract and fraud claims in a wide variety of industries. Successfully managed class actions involving real estate closing practices, retail fees charged customers, medical monitoring (asbestos), insurance claims practices, airline ticketing practices, natural gas measurement, municipal bond fraud, tax preparation software and others. Represented Special Litigation Committee of mutual fund board in derivative litigation over allegedly improper investments. Recently tried and prevailed in two preliminary injunction trials – one against the FTC and the other over a large hotel management contract. Litigated a wide variety of consumer claims in a wide variety of industries including automobile financing, retail, airline ticketing, and title insurance. Represented WireCo in arbitration proceedings filed by a computer consultant that designed and installed ERP software for WireCo’s multiple manufacturing and management offices. WireCo counterclaimed for breach of contract, professional negligence and punitive damages. The consultant sought over $3 million from WireCo, but the arbitrator awarded a net of $2.2 million to WireCo, including punitive damages. Recovered tens of millions of dollars in settlements for businesses and individuals in commercial disputes. Represented former Westar Energy Chief Strategic Officer in third pending federal criminal trial on charges arising out of actions taken during his tenure. After convincing Justice Department to drop charges shortly before the trial was to begin, took the lead in arbitration proceedings against Westar for termination benefits and other claims. The arbitration matter settled confidentially, but Westar reported in its SEC filings and to the press, that it paid Mr. Lake a total of $26 million. Represented Jacobs Engineering Group, a construction manager, in a trial in the District of Columbia Superior Court. Jacobs acted as the construction quality manager on a major remodeling project at the State Department. Plaintiff claimed he was seriously injured as a result of negligence by Jacobs. After three weeks of trial, the court granted a directed verdict based on the lack of a duty, which was affirmed by the District of Columbia Court of Appeals. Represented Salina Regional Health Center in a qui tam lawsuit brought by a disgruntled physician. Obtained summary judgment, affirmed on appeal in a precedent-setting case Conner v. Salina Regional Health Center, 543 F.3d 1211 (10th Cir. 2008). Represented Providence Medical Center in case alleging wrongful termination of privileges. Obtained summary judgment. Specialized in product liability cases including automobile equipment, asbestos, beryllium, pesticides, medical devices, gas turbines, farm equipment and cigarettes. Served as mediator, arbitrator, and expert in legal malpractice cases.